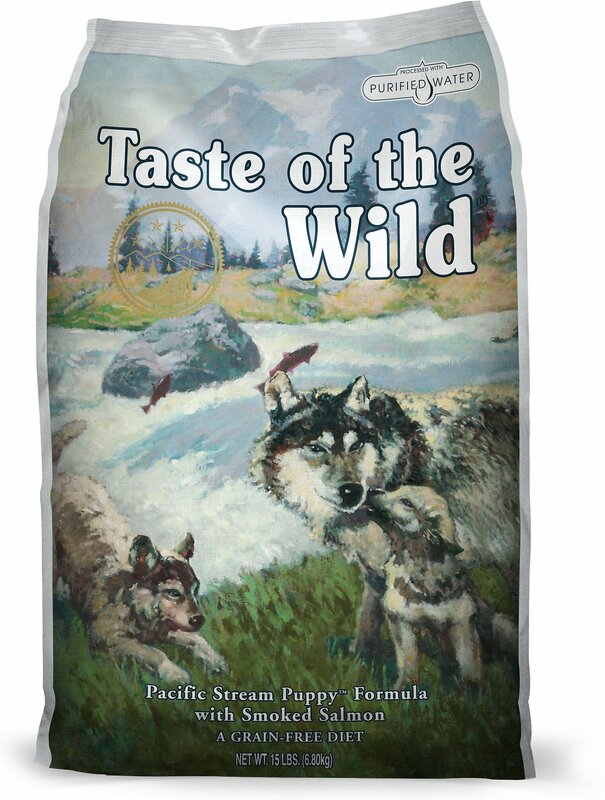 Taste of the Wild Pacific Stream puppy food is a grain-free formula providing highly digestible energy for active puppies. 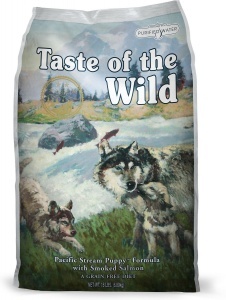 Made with real smoked salmon this formula is perfect for fish-loving junior dogs. Supplemented with vegetables and fruits this hearty formula delivers antioxidants to help give your puppy a healthy lifestyle. Salmon; ocean fish meal; sweet potatoes; peas; potatoes; canola oil; pea protein; tomato pomace; smoked salmon; salmon meal; natural flavor; salmon oil (a source of DHA); salt; choline chloride; mixed tocopherols (a preservative); dried chicory root; yucca schidigera extract; tomatoes; blueberries; raspberries; dried Lactobacillus acidophilus fermentation product; dried Bifidobacterium animalis fermentation product; dried Lactobacillus reuteri fermentation product; vitamin E supplement; iron proteinate; zinc proteinate; copper proteinate; ferrous sulfate; zinc sulfate; copper sulfate; potassium iodide; thiamine mononitrate (vitamin B1); manganese proteinate; manganous oxide; ascorbic acid; vitamin A supplement; biotin; niacin; calcium pantothenate; manganese sulfate; sodium selenite; pyridoxine hydrochloride (vitamin B6); vitamin B12 supplement; riboflavin (vitamin B2); vitamin D supplement; folic acid.